The Executive MBA program of Antwerp Management School is designed for top managers of subsidiaries and branches of foreign companies doing business in Russia as well as for top managers of Russian companies operating on the European market. We offer these business people a unique opportunity to obtain modern knowledge and practical skills in basic functional areas of management and the prestigious, original Diploma (Degree) of the Antwerp Management School, which is accredited by the International Association for Advanced Collegiate Schools of Business (AACSB International) and by the Belgium government and fully acknowledged in the EU countries, without leaving their business in Moscow. The Executive MBA program, conducted by the Antwerp Management School (AMS) in cooperation with the Institute of Business Studies (IBS-Moscow), was the first Executive MBA programme for a European Degree and Diploma in Moscow, and now it is the only programme offered by western business schools in Moscow that is listed in Financial Times ranking of top-100 best Executive MBA programmes in the world. EMBA in Moscow shares philosophy, goals and the basic principles of the Antwerp Management School Executive MBA program in Antwerp, which remains a number one in Belgium for the last 50 years. We operate in the Russian market for 20 years and have more than 700 alumni in our database. European standards of Business education: our program is taught by the executive professors of Antwerp Management School, the best Russian professors, top managers of large Russian and foreign companies which operate in Russia executive professors of MIT (Massachusetts Insitute of Technology, Boston, USA) European and Russian consultants. 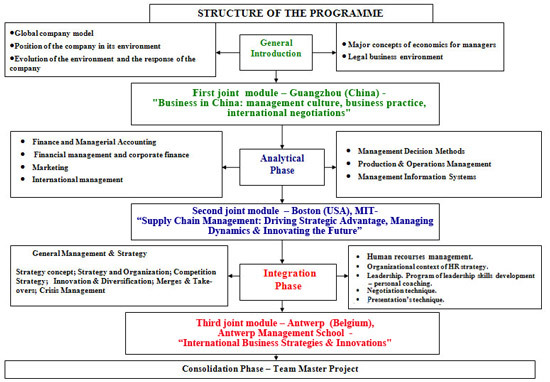 First joint module – Guangzhou, China - "Business in China: management culture, business practice, international negotiations" - Lingnan University College at Sun-Yat-Sen University). which makes it the only one Global Executive MBA in Russia. To head the team, to lead the process of change, and to make the strategic decision come true. to confront them with their personal competencies, limitations, and personality, and stimulate their personal development to overcome the related barriers. Executive MBA program is aimed at de-specialization of managers. There is no matter what is the business specialization of the participant of our program. He can be a financier, a marketing specialist, head of sales or IT-specialist, an operation manager or head of HRM department. After the graduation of the program, he must be ready to occupy the top position of the company and to be the response to the management of the whole company. Our Executive MBA program is designed for managers who have a rich practical experience in business and aim for executive career growth. Its main goal is to help the participants to structure their experience. That is why our program - Executive MBA - is shorter than a standard MBA and lasts 21 months. We aim at "de-specialization" and preparing "generalists". No matter from which functional field of company management the participant has come: marketing, finance, HR or logistics. After graduating from the programme he/she should be ready to become the Head of the company, to understand the functional managers and to synthesize their opinions (which often differ) for making strategic decisions. This leads to a more integrated approach to business education. contains more integrated and less formalized examples and case-studies; to analyze them requires a continual appeal to the practical experience of the participants. МВА generally and Executive MBA specifically is a western invention. A western provider of MBA programme serves as a quality guarantor of business education. This means the latest breakthroughs in management science and the best contemporary hands-on management practices, high-quality course books, new cases and methods of teaching, experienced business professors and consultants. Finally, this means a prestigious European Degree and Diploma. But in contrast to the MBA programmes of other western business schools operating on the Russian market where the Russian partner bares simply the organizational functions, in our programme the Russian component brings independent added value. Russian business professors, consultants, and experts, engaged in our programme, are certified by the Antwerp Management School, follow AMS syllabus and use books recommended by the Belgium course leaders. Nevertheless, being in close and informal contact with professors of AMS, Russian professors are able to influence the contents of the programme as well as the methods of teaching, taking into account Russian economic, business and cultural peculiarities and thus make education more effective for Russian managers. The programme exists on the Russian market for more than 20 years, and during this period we created a unique international team of professors. Learning is a two-way process. It's impossible to achieve a high quality of business education without active collaboration with the participants. Our participants are people who seek knowledge and want to structure and generalize their practical experience and are ready to work hard for that. We stand for forming small homogeneous groups (not larger than 20-25 people) by carefully selecting those candidates who have large practical experience in business, a serious motivation, high intellectual and educational level. Our participants are ready to share their experience and learn from each other, thus incarnating the basic principle of western business education: "Enrichment through sharing". Wherever it is possible (even on the stage of the final Master Project) we practice teamwork. One of the questions which we like to ask during the interview is "What could you bring to a team? What part of your practical and professional experience could be interesting for the other participants?" Teamwork helps the participants to establish strong and productive connections, which (as the participants themselves say) help them not just on the stage of learning at the programme, but also in their business and everyday life after the graduation. WEEKEND format eliminates the need 2-3 times a week leave from work for 1-2 hours early to catch a class and prevent you from constant stress associated with standing in horrendous traffic jams in Moscow or travel in a crowded subway (which, unfortunately, is typical for an evening format). WEEKEND format includes the classes once a month from Thursday to Sunday. The WEEKEND format requires you to periodic multi-day absences in the office, which is typical for a modular format and, unfortunately, may not always be approved by your employer. Format WEEKEND provides almost the same regularity of the sessions that evening format, together with a deep immersion in the material under study and fellowship with fellow group characteristic of a modular format. Format WEEKEND - a format «COMBI», which combines the advantages of an evening and a modular format and minimizes their shortcomings. At least 7 years of management experience (at least 28 years old). Fluent English – Upper-intermediate level.